Ships from and sold by LocateBooks Australia. A critically acclaimed poet examines what it means to be a man and offers men advice on how to mourn for the remoteness of their biological fathers and embrace new role models. Reprint. 40,000 first printing. 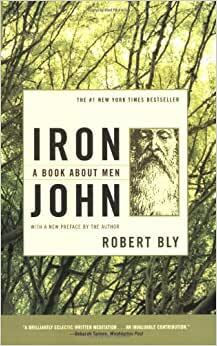 Start reading Iron John: A Book About Men on your Kindle in under a minute. Robert Bly is the author of many books of poetry. He is also a renowned translator, editor, and a founder of the Men's Movement. He lives in Minneapolis and in Moose Lake, Minnesota. There were times reading this book that Bly would communicate an idea which rang so true to me that I’d literally get physical shivers up and down my spine. It is that powerful and resonant. This book has made me see my own life and history with an illuminating radiance, and I’ve been able to discover bits and pieces of myself that were lying in dark corners. This book is not for those who live purely on a rational plane. If you despise poetry, for instance, you may find the book tedious, boring and difficult. If, on the other hand, you can read between the lines, visualize abstract metaphors, and appreciate poetic language, then this book will offer you a treasure trove of insight about yourself. I bought this book, with the thought: "It was written by a man, about men, being manly!" I thought this book would be a celebration of men. But the book is not about men. The book is about boys and ritual into manhood, or as I perceive it: "How today's political correct world has emasculated male energy." This book talks a lot about "the Mother", "the Earth Mother" and golden apples. This book is for today, where every child is a special snowflake. Where there are no winners and losers, because whatever is wrong with you, it's not your fault. This book is not about men. It is a book about the psychology of boys and teens, and why being weak and emasculated is their true and right nature. I was hoping for something like the lore of John Henry or Paul Bunyan, but instead found only tales about boys. I find the anthology of Norse Myths is a better example of "A book about men", or Richard Marcinko's autobiography: "Rogue Warrior." If you, or your son, has "mama issues" then this book will probably help explain it. It is articulate, well researched an well written. Just not what I was looking for. Thank you. 5.0 out of 5 starsMindblowing! The ONE book for Men! I am 37 today. And the book has depicted my past year of experience and growth from a boy to the Man I feel now. Bly says there are 3 characteristics of a boy who did not yet become a man: naivete, passivity and numbness. For 6+ yrs in therapy I have revived my feelings and I don't feel numb any more, but I know why I need my emotions for and use them. But this past year has been the year when I lost my naivite and passivity. And the book has just come right in time to summarize my 37 years of growth to come into adult world. Read it earlier rather than later! The depth of this book is stunning. I love this book so much I bought two additional copies as Christmas presents for my friends. Robert Bly is a fantastic writer. Part poet, part cultural anthropologist, he has a style that is both lush and crisp at the same time. He is clearly a fan of Joseph Campbell; the structure of his book evokes Campbell's style. However, this is no insult. Few have the talent or skill to write in such a breezy yet lucid fashion. And Joseph Campbell is one of the twentieth century's greatest minds. Clearly, Robert is a helluva writer. Robert has an ability to explain complicated emotional states with ease. His understanding of what men need is equally profound. And while the book is far from thick I've found my pace through the book to be deliberately slow; every page is so rich with thought it leaves me with much to ponder. If you're a thinking man who realizes that modern society does not value manhood and that we've been driven away from what men are supposed to be then this book must be read by you immediately. This book acknowledges and explains how deep and multi-layered men really are. This is Fight Club for intellectuals. By it immediately...then buy three more copies for your best friends and make them read it as well. That's exactly what I did! Its excellent and easily read. Reading it as a mother for my sons.... though that kind of goes off the message the book is trying to tell, I am realizing. My own father was absent, and I bonded with cruel or callous masculine qualities. I adopted an immature masculine view of women, of myself becoming a woman. Only motherhood and the intentional relationships formed bw other mothers and midwives who helped me have my babies, and gurus of feminine sexuality I was lucky enough to meet while still in my 20s, shattered my "othered" view of myself, and helped me start to become liberated and in so becoming liberated, I could for the first time become genuinely curious about the masculine.